	Offers an excellent text for those learning to construct, design and operate sustainable buildings. 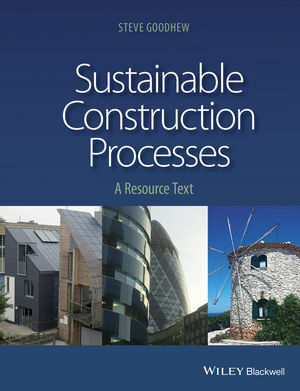 	Covers the drivers for sustainable construction, definitions, historical impacts, climate change and global, regional and individual responses. 	enables the construction professional to achieve optimum solutions, both in design, process and the aftercare of buildings. 	evaluates the effectiveness of different renewable technologies and provides guidance on the practicalities of their use. 	Alerts the reader to future trends in this field. Steve Goodhew is Professor of Environmental Building and Discipline Leader in the School of Architecture, Design and Environment at Plymouth University. He has been teaching and researching in the area of sustainable construction for over 20 years. His main focus has been the assessment and monitoring of existing buildings specialising in the in situ measurement of the thermal properties of building materials, particularly the use of thermal imaging.